HomeNews & EventsNewsAkbo brings home gold! 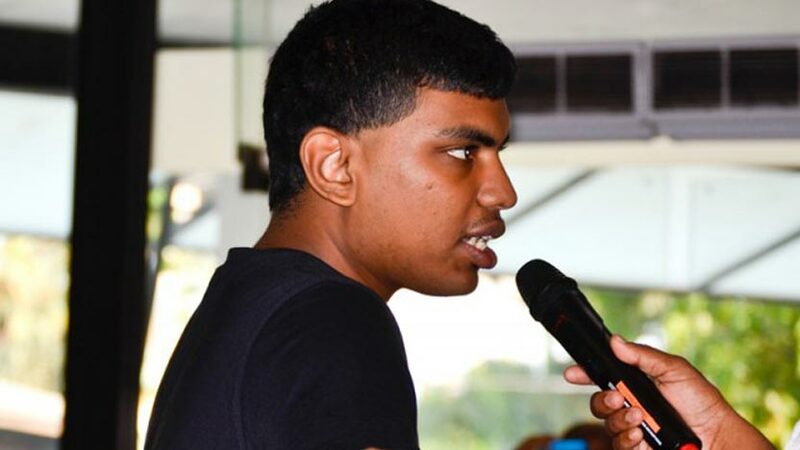 “I never thought this dream a possibility, but I worked hard and achieved it somehow,” says a smiling Akbo Manula Jayawardana, after placing first in both the 200m and 100m running events at the Special Olympics World Games 2015 held in Los Angeles this year. Making his way to becoming a pro-athlete, the star champion brought home two gold medals achieving so much for himself and bringing glory to Sri Lanka. 25 year-old Akbo is a bright student of the MJF Charitable Foundation’s Rainbow Centre in Moratuwa and has been diagnosed with Asperger’s syndrome; an autism spectrum condition that is characterized by difficulties in social interaction and nonverbal communication, alongside high-functioning and repetitive patterns of behaviour. Akbo’s parents Amali and Gamini and his sister Dhilanki have always been supportive of his interests. Having recognized their child as being a differently-abled individual, they sought the best professional help with neurologists and autism therapists in America. When he was introduced to The MJF Charitable Foundation’s Rainbow Centre in Moratuwa, the teachers and staff took him under their wing and continued to create an encouraging and holistic environment that helped Akbo thrive. The Rainbow Centre provides care for children diagnosed with Autism, Cerebral Palsy and Down Syndrome, giving them a chance of a better and more productive life. Providing special education and therapy for children from infancy to adulthood, the centre provides services for children from as small as 1-3 years of age to those who are 35 years old diagnosed with a multitude of conditions including development delays and Learning disabilities. Special education, training and development of life skills and social skills, enabling independent living and vocational training are offered to the students at the Rainbow Centre in order to empower and enrich their lives. Programmes include special education, singing and dancing lessons, hand crafts, painting, sewing, carpentry as well as stretching and breathing exercises, sign language classes and the opportunity to engage in home gardening at the Dilmah Conservation Sustainable Agriculture Research Centre situated within the MJF Centre in Moratuwa. Akbo has also sat for the London Ordinary Level examination and attended leadership training in Singapore. He will now be training with junior and national athletes in badminton, running and deep-end swimming for the Special Olympics of 2017 due to be held in Austria.